In the 2018 tournament the group tournament games have successfully finished and today teams will play final games for places. 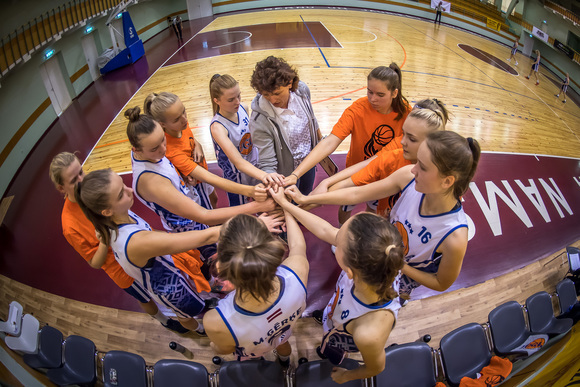 Finals will start at 9.30 at Rīdzene sport hall between UKS Kartuzy and BC Saule that will play for the 5th place in U-15, then at 10.00 in Daugava sports hall - game for the 3rd place in U-15 between BS Rīga/Rīdzene and BS Riga/TTP-1. Final in U-15 group will start at 11.45 between Dinamo Kursk and 3.BJSS teams. In group U-17 at 11.15 in Rīdzene sport hall - game for the 5th place between Soprona Darazsak Akademia and Tartu Kalev select, at 15.15 in Daugava sports hall game for the 3rd place between BS Rīga/Rīdzene and 3.BJSS, but the final game for the 1st place in U-17 will start at 13.30 between BS Rīga/Jugla and Nevskaja Bassketball school teams. Come and support our girls in the finals!